Clothes dryers in most cases are designed to vent to the exterior. This allows for excess moisture and lint to flow to the outside where they can be dissipated. Allowing lint to build up in the dryer vent line or vent cap can not only degrade dryer efficiency and add to energy bills, but it can also be a potential fire hazard. As a reminder, screened exterior dryer vents are not permitted as they can collect lint. 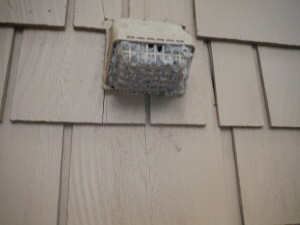 In addition, you should regularly have your dryer vent lines cleaned to prevent lint build up.